The Haunting of Toby Jugg is a supernatural thriller set during World War 2. The central character, Toby Jugg, is a wounded RAF pilot who is confined to a wheelchair. Toby might be crippled physically, but financially he/s sitting pretty because on his upcoming 21st birthday he will inherit his grandfather’s business empire which is worth many millions of pounds. Toby’s was eight-years-old when his grandfather died. The old man had gone up in the prototype of a new airliner and had taken Toby’s father with him. The airliner crashed and both men were killed. Toby’s mother died giving birth to him; so after the accident, his only living relatives were his Uncle Paul and Aunt Julia (Paul’s wife). Paul was a constant disappointment to his father so the old man more or less cut him out of his will and left everything to Toby. Until he celebrates his 21st birthday though, a board of trustees continues to take care of Jugg business. Toby’s uncle bears him no ill will, however, and after the airliner crashed Paul and Julia felt that it would be best for him to be with his family, so they took him in to live with them. Toby likes his uncle and positively adores Julia so he was happy with the arrangement. While at Weylands, one of Toby’s tutors was a man called Helmuth Lisicky. When Toby left the school Helmuth went with him and became his personal tutor. Paul and Julia have a lot of faith in Helmuth so after Toby is injured, and with the war still going strong, it was agreed that Helmuth would care for Toby when he was sent to convalesce at Llanfordrach Castle in Wales. This is where the reader finds Toby on the first page of the book. The Haunting of Toby Jugg is presented in journal form, so the book is split up into dates rather than chapters. The first entry is Monday 4th of May and Toby writes that he is worried he may be going mad because he is being haunted by a strange, shadowy presence at the window; and he can see the monster’s shadow moving about in the moonlight that shines through the gap at the bottom of his blackout curtains. It is a fearsome creature with many legs, and it emits such a feeling evil it terrifies the wounded airman. Toby began keeping the journal as a means of keeping track of these strange events. He used to enjoy writing essays and feels that the process of setting his thoughts down on paper might help prevent him from focusing too much of his attention on his fears. 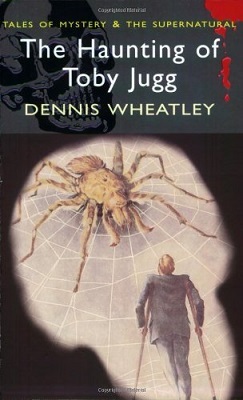 While he is documenting his experiences though, Toby gradually comes to believe that he is not suffering from delusions at all and that there is a sinister plot against him. To make matters worse, when he writes and asks his Aunt Julia to visit him she does not come. Nor does he receive a single letter from her. Then one day Toby has a chance encounter with the mailman and picks up his own mail for a change. As soon as he reads Julia’s letter he realizes that someone has been intercepting his mail. The Haunting of Toby Jugg is 307 pages long and I had to turn quite a few of those pages before I began to get pulled into the story; probably because it reads a little like an essay—or so it seemed so to me anyway. However, right it was hard not to become interested in learning more about the monster at Toby’s window. My curiosity kept me reading and once I got a little way into the book I became more comfortable with the prose and soon had plenty of other questions in my head that could only be answered if I read to the end. If you decide to read The Haunting of Toby Jugg, you will probably enjoy the book because it has some great characters, even if it isn’t always easy to tell the real motives behind the things they do. Helmuth, for instance, is a very dynamic man and for a lot of the book, it remains a mystery whether he is part of the problem or if he really does have Toby’s best interests at heart. The Haunting of Toby Jugg is, in part, a mystery, but with supernatural presences and satanic cults, it is also very much a horror story. Towards the end of the book it even has the aspects of a love story, so if you do decide to read it you will find plenty happening and perhaps get few surprises as well.